Join us on October 18, 2014 for our Third Science Photo Walk! Use your artistic skills to capture our Research at Work by submitting photos into our contest that best exemplify "Accelerating Science for Canada." Winning photos will receive prizes, a feature publication in symmetry online magazine and a feature exhibition at Science World. – A local group of experts will be invited to choose the best photos, in their professional opinion. Jury will includes representatives from Emily Carr University of Art + Design, Science World, the University Neighbourhood Association and more. – The long list of photos will be uploaded to Flickr and social media. A snapshot of total 'likes' per photo will dictate the winners. 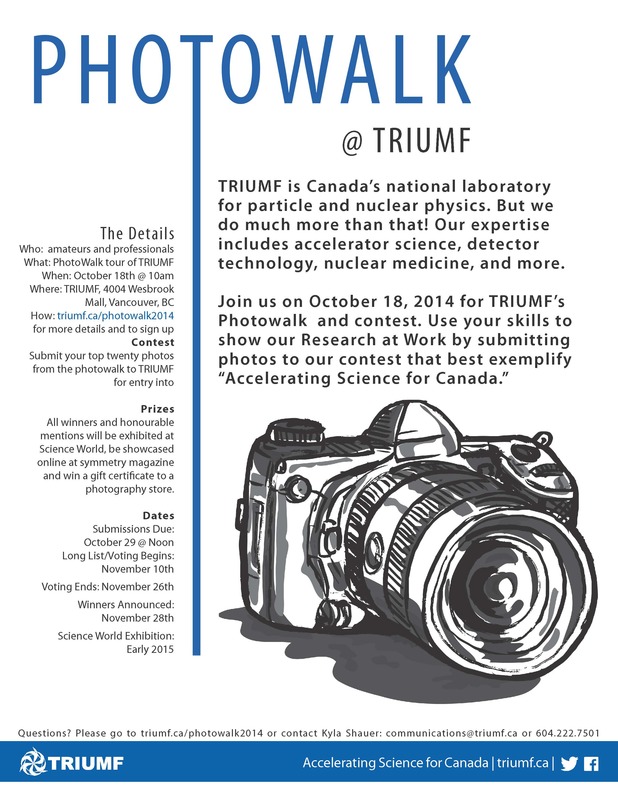 –TRIUMF researchers will vote for the photo that best represents "Research at Work: Accelerating Science for Canada." Entry for the photo walk event has now closed. Submissions for the contest are now being accepted.